Today's hero of choice is The Sandman! 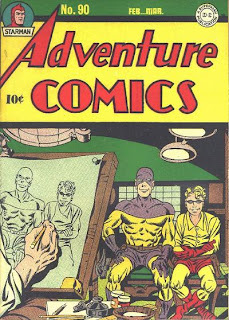 I'm talking about the Simon/Kirby version from the 1940s. Yellow tights with purple accouterments. It was the first comic book character called Sandman that I encountered and, despite years of seeing other characters using the name, I still always think back to this one when I hear the name. The Sandman's costume here is probably the simplest of all the Sandman costumes in terms of design. Yellow tights. Purple gloves, boots, cowl and shorts. Brown belt with a sidearm attached. No chest logo, no cape, extra headgear. It's about as bear-bones as you can get visually. So what attracted me to the character? Well, he did have a few things working for him. First, the cowl bit came down well over his shoulders. That was kind of cool and original, especially in lieu of a chest emblem. Second, he was a hero that made no effort to hide the fact that he carried a gun. Although, I would later encounter all sorts of gun-toting heroes, he was the first (and for a long time, only) one I saw who did so. Third, it's a pretty decent color combination (one which I would later learn to be my high school colors). Indeed, Sandman's costume was much better than his sidekick's precisely because the red/yellow combination was decidedly inferior. Add in the fact that it was expertly drawn by Mr. Jack Kirby, and I was sold with a single, poorly reprinted story in the back of one of DC's giant-size issues from the 1970s. I've since picked up many of his adventures in microfiche format (which was before DC's nice Archive editions).